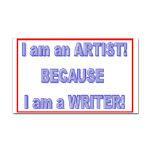 Show everyone you're a writer and proud of it! Keep a list of essential story elements handy! These are the current designs on the items you will find in my shop! Clicking on a product will take you directly to the store where you will see a description of the product and a larger view of the design. They offer a variety of payment options, including credit cards and PayPal. Many of the products have a design on the front and another on the back. They were designed for the purpose of letting other people know that you are a writer and to give you a handy little list of required story parts to help with your writing. Keep your important reminders handy. Keep the story elements handy.